Go to the attic and look for dark water stains in rafters and the insulation. With wooden roofs, you may see light passing through pinholes; when it rains, water normally swells the wood and closes the holes - but look for signs of water leakage. Look for missing shingles, cracked tiles, warped or gapping shakes. Check the roofline, if it sags, you may have a long time leak and structural problem. If you have an asphalt roof, check for thin, weatherworn shingles. Brittle shingles have lost some of their protective oils. 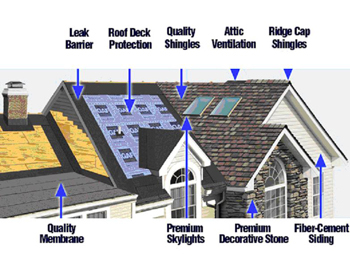 Wood shakes and shingles will warp, split, thin in the sun and rain, and be torn off by high winds. Copyright © 2015 Sun Roofing & Construction, Inc. All rights reserved. Powered by TechKnowledge.